» Best bike towns? Right here! Best bike towns? Right here! 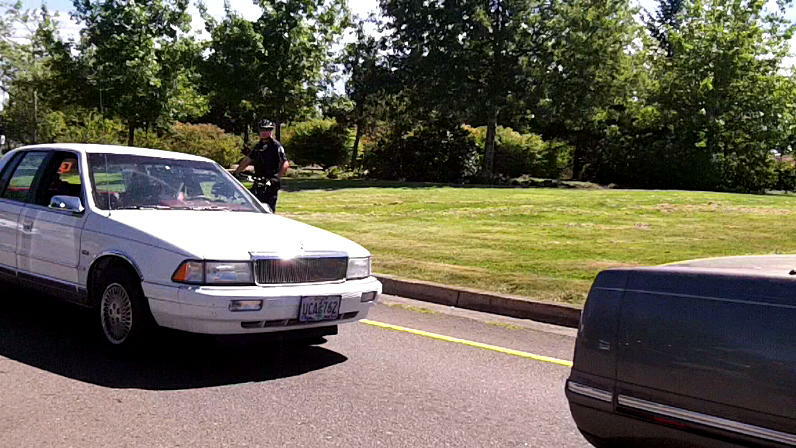 Another angle: An Albany bike cop on patrol recently, watching for seat belt violations near Santiam and Pacific. Once again Albany has missed out being mentioned among America’s 50 best bike cities as listed by Bicycling magazine. Corvallis and Lebanon got left out, too. The likely reason: the magazine’s list consists only of cities of 100,000 or more, and most are much bigger than that. As it happens, mid-valley towns are great for cycling, partly because of their relatively small size but mostly because they thave taken care to plan and provide for pedal-powered transportation on two wheels. Albany’s ratio of bike lanes and paths per square mile is 2.9 (53 miles of lanes in 18 square miles). That, incidentally, is better than the 2.5 listed for Portland, which is fourth on the magazine’s list. Beyond that, volunteers have seen to it that Albany grade schools have an active bike training and safety program for fifth-graders. And the city has a special advisory conmission on bicycle and pedestrian concerns. Albany also has a bronze designation as a bike-friendly town from the League of American Bicyclists. Many businesses and some places of employment have provided a place to park or secure bikes, making it relativey easy to get around town for work or errands.